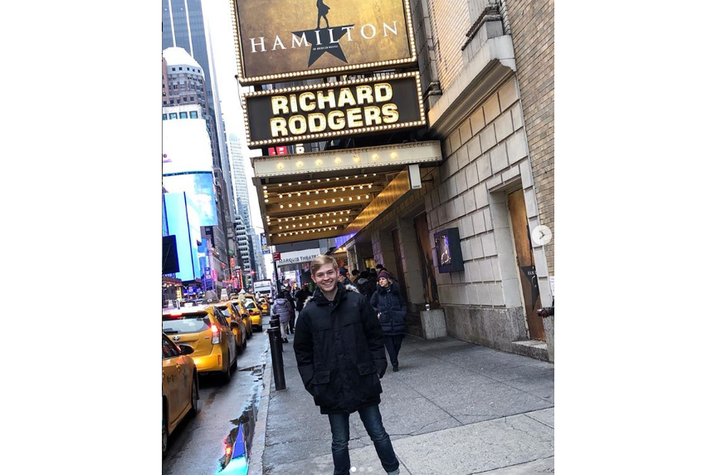 LEXINGTON, Ky. (April 10, 2019) — University of Kentucky theatre graduate Patrick Garr has joined the Angelica Tour of the award-winning Broadway phenomenon "Hamilton." The UK alumnus, who will be taking the stage as Samuel Seabury and Man 2, is scheduled to perform in Kentucky when the tour comes to Louisville this June. A musical on the life of founding father Alexander Hamilton with music, lyrics and book by Lin-Manuel Miranda, "Hamilton" won 11 Tony Awards, including best musical in 2016. It continues to dominate the world of musical theatre, with productions on Broadway, in San Francisco, Chicago and London, as well as two tours running across the U.S.
A dancer, singer, actor, choreographer and dance instructor, Garr earned his bachelor's degree in theatre, a musical theatre certificate and minor in dance from UK in 2016. Local audiences may remember him from UK Department of Theatre and Dance productions of "Joseph and the Amazing Technicolor Dreamcoat," "Hair" and several annual dance concerts. Garr, who recently finished a turn as a swing with "Mean Girls" on Broadway, has appeared in "Jerome Robbins Broadway" and "Fiddler on the Roof" with The MUNY; "Hello Dolly," "Aida," "My Son Pinocchio," "Billy Elliot" and "Big Fish" with Music Theatre Wichita; and "Mary Poppins" with The Lexington Theatre Company. A native of Lexington, Garr started dancing at the age of 3 following an Irish clogging show. His dance performance work encompasses many dance conventions including New York City Dance Alliance, LA Dance Force, Company Dance and many more. After dancing competitively for five years, Garr studied at Lexington's School for the Creative and Performing Arts and the Kentucky Governor's School for the Arts, which led him to become a triple threat in dance, singing and acting. Garr appeared on the 2012 MTI Broadway Jr. Choreography DVD of "Fiddler on the Roof," "Hairspray," "Xanadu" and "Magic Treehouse" with iTheatrics in New York City. As a choreographer, Garr's credits include "Addams Family" regionally at Woodford Theatre, "Thoroughly Modern Millie," and selections from "Chicago," "Matilda" and "Pippin," as well as commercial dance works. In addition to choreographing, he has taught at Man In Motion! in New York City as well as Groove Dance Competition and Varsity All Stars dance competition as a judge and masterclass dance instructor. Garr also teaches classes, workshops and private lessons in the greater New York City area. The Department of Theatre and Dance, part of UK College of Fine Arts, is an accredited institutional member of the National Association of Schools of Theatre (NAST). Students in the Department of Theatre and Dance get hands-on training and one-on-one mentorship from professional faculty and renowned guest artists in acting, directing, playwriting, theatrical design and technology. From mainstage productions to student-produced shows, students have plenty of opportunities to participate on stage or backstage. Special programs include a musical theatre certificate, education abroad, as well as a thriving dance program that emphasizes technique, composition, performance and production.